It’s no secret: we want more employees. Above all, we would like to see more female Goodgamers. Some women cannot imagine working in the gaming industry (yet), which is why, on February 20th, it was time for the second Goodgame Studios Ladies’ Night. 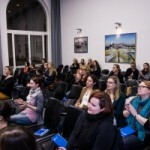 As part of the annual Social Media Week, we again put on an information evening especially for women, at the Handelskammer Hamburg. Bettina, an e-business expert at the Chamber of Commerce, opened the evening. 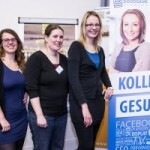 Two female employees gave insights into their daily working life. Alina, project manager, acts as a key communication link between a number of departments and coordinates ten (predominantly male) colleagues. As a senior server developer, Claire is a bit of a rare specimen in the java team, and she hopes that more and more women will have the confidence to study computer science. She can assure them that it’s really not boring at all. Stephanie Enge completed the line-up. She is a freelance tech journalist who studied computer science, completed a traineeship at Axel Springer, and now combines her two passions: gaming and writing. She was able to give the audience a slightly different perspective in her talk. All three speakers talked about their experiences of being a woman in the gaming industry. Fortunately, Alina and Claire had encountered little prejudice. Stefanie however, who also tests new games for the gaming section of the newspaper Bild, has had to struggle against many stereotypes. Sadly, the world of men still sometimes gets annoyed when a woman prefers Counter Strike to The Sims. With this evening, we want to show that there is no place for prejudice in the gaming industry! Hair color, fashion sense, gender? The only thing that counts here is ability. We hope that this evening has convinced at least a few participants. We welcome applications, and if 300 of this year’s planned 600 newcomers are women, then so much the better.